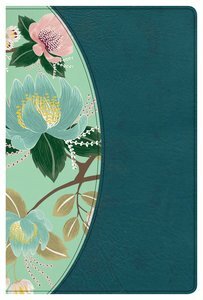 About "CSB Study Bible For Women Teal Flowers Indexed"
Now available in the Christian Standard Bible (CSB) translation with revised and updated content and a fresh, new interior design, the CSB Study Bible for Women will equip you to reach deep into God's Word. As the most comprehensive study Bible ever prepared for women and by women, the most powerful aspect of this Bible are the "threads" of specialized study thoughtfully woven throughout pointing you to God's larger story and allowing the Holy Spirit to write His revealed truths on your heart. In the CSB Study Bible for Women, you'll join a host of other women, all academically trained in the original languages of the Bible and passionate about God's Word, for an intimately deep dive into Scripture that will equip you to unlock the riches and majesty of His Word, and ignite a passion to mentor others in your life to do the same. Features include: Smyth-sewn binding, Two-column text, 8-point type, Extensive commentary notes, Word studies, Answers to hard questions, Doctrinal notes, Biblical womanhood articles, Character profiles, "Written on My Heart" applications, Extensive book introductions, Presentation page, In-text maps, charts & timelines, Concordance that lists every woman mentioned in the Bible, Full-color maps, and more. The CSB Study Bible for Women features the highly reliable, highly readable text of the Christian Standard Bible (CSB), which stays as literal as possible to the Bible's original meaning without sacrificing clarity. The CSB's optimal blend of accuracy and readability makes Scripture more moving, more memorable, and more motivating to read and share with others. Patterson is a homemaker, professor at Southeastern Baptist Theological Seminary, and a successful writer and speaker.